One of the most dangerous insects known to man! 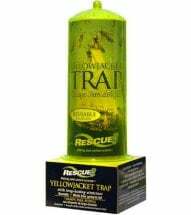 Learn how to get rid of yellow jackets naturally without resorting to toxic chemicals. Yellow jackets (Vespula spp.) 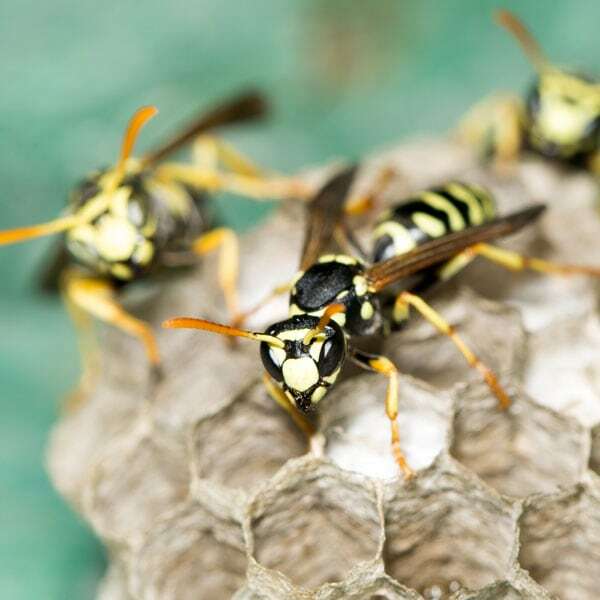 are more aggressive than other stinging insects, such as wasps, hornets or bees, and will vigorously defend their nests. Swarm attacks can occur when a nest opening is accidentally stepped on or hit with equipment. Ground vibrations from lawnmowers have also been known to trigger an attack, especially in late summer. Considered beneficial around home gardens, yellow jackets prey on insects such as caterpillars, spiders, flies and even mollusks. Unfortunately, by late summer, when their populations peak, they can be a problem pest around picnic tables, trash cans and hummingbird feeders. Note: Yellow jacket workers can travel up to 1,000 feet (3 football fields) from their nest while forage for food. The yellow jacket queen is the only member of a colony that will survive the winter. In spring, she digs a cavity in soil or enlarges an existing hole, constructs a nest and lays a dozen or so eggs. After 3-5 days young larvae hatch and are fed by the queen until they mature to workers and can forage for themselves. Eventually, the queen restricts her activity to producing eggs while the workers feed her and care for the larvae and pupae. During the summer, the nest grows until there are several layers of comb enclosed in a paper envelope. In late summer, newly developed males and queens leave the nest and begin mating. Males die shortly after mating, while females seek out suitable sites in which to overwinter. 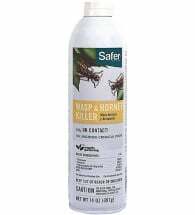 Spray Safer® Wasp & Hornet Killer directly into the nest opening. Do this at dusk or early morning when stinging insects are least active. 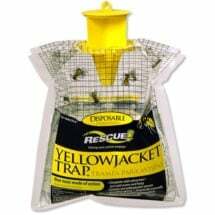 If you can’t find the nest, hang reusable or disposable traps around backyards and patios, trash cans and campsites to reduce pest numbers. Designed to mimic an enemy nest, The Original Waspinator works by sending the message that the area is already inhabited. 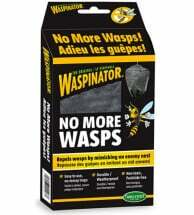 Stinging insects stay away! Cover trash cans/bins and keep them clean so insects are not attracted. 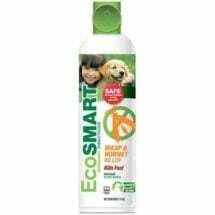 If recycling, rinse materials before putting them in the bin. Store refuse containers well away from outdoor eating areas to reduce the number of encounters. Keep pet food indoors. Seal cracks, crevices, vents, screens and other entry points to prevent access into homes or sheds. Most people will experience immediate pain when stung. Symptoms will include localized reddening, swelling and itching. Unlike bees, yellow jackets will not leave a barbed stinger in the skin and can sting multiple times. Wash the site with soapy water to help remove the venom. Apply ice in a damp cloth to reduce swelling and ease pain. If necessary, take ibuprofen or Benadryl to relieve pain and itchy skin. If the sting is in the mouth or throat, seek medical attention. Swelling in these areas can cause suffocation. If you experience trouble breathing, dizziness or fainting, contact a physician immediately. This decoy nest tells wasps they're in enemy territory, and they fly elsewhere. Unique design captures all major species -- will NOT attract beneficial honeybees.